Our educational context today is drastically different than it was at the turn of the century. And, unfortunately, those changes have not all been positive. NCLB, enacted in 2001, was built upon deficit beliefs about culturally and linguistically diverse students. Ironically, the high stakes testing that was branded as a policy to help our most vulnerable student populations, has done the opposite. Over the last 17 years, there has been wide-spread adoption of regressive, scripted curriculum, particularly in schools that serve diverse students. We are witnessing how these programs are growing disengaged, dependent learners and increasing inequities in access to high-quality teaching and learning. With support from a LRNG Innovators Challenge Grant, our team of 6 elementary teachers from rural Bastrop, Texas and I, a teacher-consultant with the Heart of Texas Writing Project, embarked on a year-long journey of deep professional development to create responsive curriculum that grows authentic, enthusiastic, and motivated writers in our rural Title I kindergarten, second, and third grade classrooms. Together we designed, implemented, and documented original and responsive Writing Workshop units of study that culminated in publication out in the local community and digitally. Here, you can view teachers’ multi-modal slideshow documentations of their units of study. Using Buncee’s user-friendly creation and presentation tool, teachers employed audio, video, text, and images to share teaching tips, writing conferences, anchor charts, student work, ideas for publication parties, parent feedback, and supporting research. Click here to read more about our process of implementing and documenting these units of study. Engaging students in process writing toward real audiences isn’t new. For decades, peer-reviewed research around writing process pedagogy has spoken to the power of a deadline, an expectant audience, and an authentic purpose. An author’s purpose for public writing is dependent on an anticipated reader. And, in schools, for that purpose to be authentic rather than, say, for the purpose of getting a grade or complying with an assignment, the primary audience must be a reader other than the teacher. And so, some of the reasons we have students write for authentic audiences today are the same motives teachers of writing have had for years. Students’ voices, interests, stories, and experiences should reach real readers. Through our Choice and Voice LRNG grant work, we have begun to unite with our colleagues, administrators, families, and community members in solidarity and support of excellent and equitable instruction for all students. We made intentional decisions about what, where, and how we published student work in order to navigate the considerable challenges of the time. Each of our six Choice and Voice LRNG grant team teachers designed, implemented, and documented two units of study that culminated in publication. 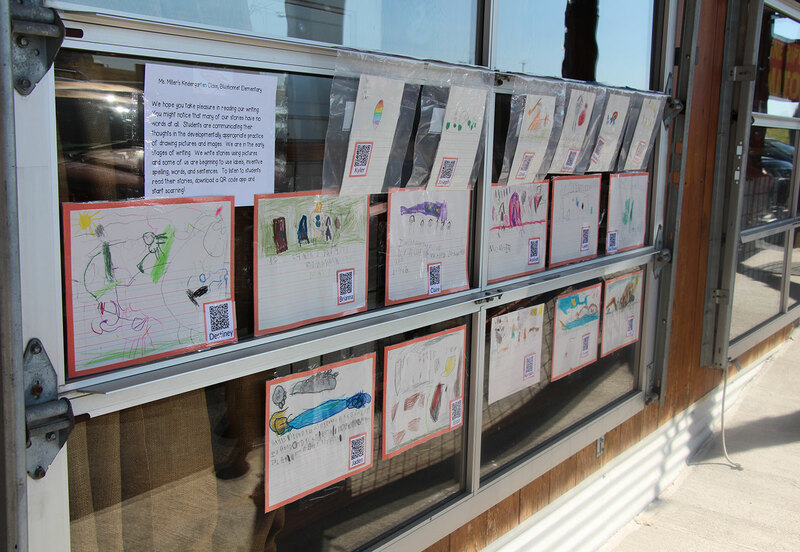 In the fall, we partnered with local businesses and organizations to display our students’ work in community spaces. In the spring, our students published digitally and those digital publications were shared on local websites and with classes around the world through the buncee buddies program. The below videos provide a narrated overview of each unit, with special attention to the larger implications of going public with student work today. This first introductory video helps orient our LRNG grant work and sets up the following videos. Aquí puedes ver el video introductorio en español. As you have seen, the Choice and Voice team’s work of intentionally and thoughtfully sharing student writing in community and digital spaces helped each teacher to advocate for high-quality process writing. In addition, documenting the teaching behind each unit helped each teacher highlight the organic processes and embrace her role as teacher leader and professional educator. Through sharing these documentations, we continue to advocate for research-based process writing in all of our classrooms with all of our incredible young authors. We hope you’ll engage with us in this important conversation through commenting below and sharing with us stories of your own work publishing authentic student writing in the community.